Suspected Al-Qaeda militants killed a policeman and a civilian in a grenade attack on a checkpoint in southeastern Yemen on Saturday, a security official and witnesses said. The two assailants threw a grenade at the police checkpoint in the coastal town of Al-Shihr in Hadramawt province, the sources said, adding that two other policemen were wounded. The security official said the attack bore the hallmarks of Al-Qaeda militants, who are active in the region, without giving further details. Fighters loyal to Al-Qaeda have seized villages near the port city of Mukalla, the Hadramawt capital, in an apparent bid to take over parts of the province, the interior ministry said on Friday. It said the uprising in Hadramawt would suffer the “same fate as that in Abyan” province east of the main southern port of Aden. 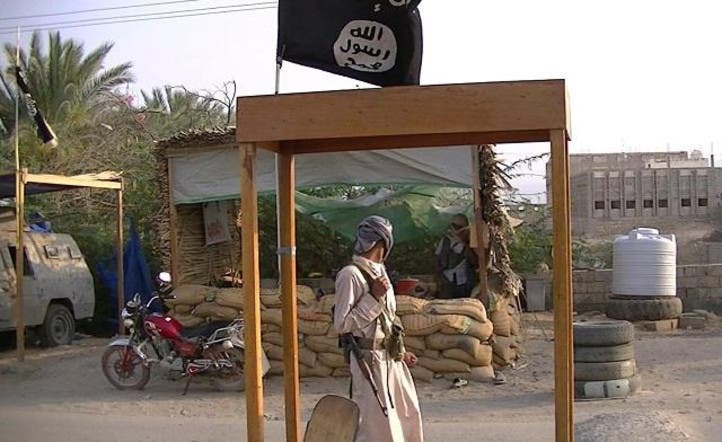 Al-Qaeda militants seized several towns in Abyan from 2011 to 2012, taking advantage of the collapse of central government control during 11 months of protests that eventually forced veteran president Ali Abdullah Saleh from power. In the towns they seized, the militants enforced a strict version of sharia (Islamic law), which included punishments such as public executions and amputations, before the army drove them out.